Experience High Productivity: The incredibly fast file processing and print speeds allow you get a D-size print out in a little as 21 seconds (Economy Mode). You can also change ink "on the fly" without stopping the printer. Work in the cloud: The new iPF Direct Print and Share software provides a cloud-based portal that allows users to expand their workflow outside of their local network. Save with Lower Ink Costs: The iPF785 is capable of using either 130ml or 300ml ink tanks. Mix and match - buy the larger tanks for the colors you use the most and watch your price per milliliter of ink plummet. Print Great Looking Reds: The new magenta ink formulation improves the clarity and vibrancy of red lines and images. Ideal for businesses, schools, architects, engineers, or anyone needing CAD files or full color posters! For increased productivity, the iPF785 printer comes with a 320GB hard drive built in, allowing for enhanced file processing, personal mailbox space, and job storage of up to 500 print jobs! From a software perspective, the iPF785 printer comes loaded with user-friendly software solutions that are ready to be used right out of the box. Direct Print & Share, Canon's cloud-based portal solution1, is available as a download and allows for files to be uploaded, downloaded, shared and printed from almost anywhere in the world! Also downloadable is a mobile printing app, imagePROGRAF Print Utility2, allows for PDFs to be printed through use of an Apple© iPad©. The Accounting Manager software allows users to track job costs, while the Print Plug-in for Microsoft Office enables for documents created with Word, Excel or Powerpoint to be printed in large format. And to improve versatility, the iPF785 printer has a Media Configuration Tool which allows customers to optimally utilize their Canon-branded media in creating their desired output. 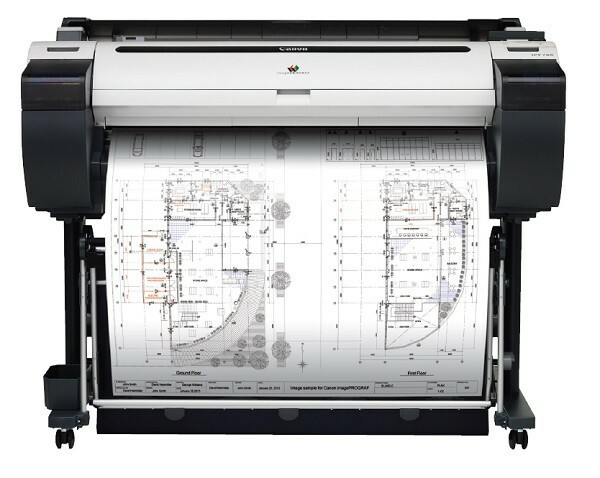 Download our Canon Cost Analysis Sheets and get an idea of what it cost per page or per square foot to use a Canon iPF plotter. Knowledge is power when planning your Total Cost of Operation (TCO).